With the dawning of the Age of Lost Omens, a supernatural hurricane known as the Eye of Abendego brought ruin to the nation of Lirgen. Today, what was once a powerful nation exists as a flooded swampland, its fallen cities immersed under the endless flood of a perpetual storm. In Hyrantam, the ruined capital of Lirgen, a few stubborn survivors have managed to eke out a living for themselves, but now, strange new patterns in the storm that constantly looms on the horizon have swept local predators into violent frenzies. Worse, a new sect of strange seers known as the Stormreaders has come to the area, and its demands on the people of Hyrantam have grown increasingly dire. What link might the Stormreaders have to these new squalls, and what vile plots might they be hatching from their new seat of power deep in the drowned city's ruins? Seers of the Drowned City is an adventure for 6th-level characters and features a poster map of the ruins of Hyrantam. The author of this adventure, Nicholas Wasko, was the Season 9 winner of the RPG Superstar contest, in which hundreds of unpublished authors compete for the chance to write a Pathfinder Module. In addition, this book contains a host of new monsters and magic items designed by the contest's talented runners-up. 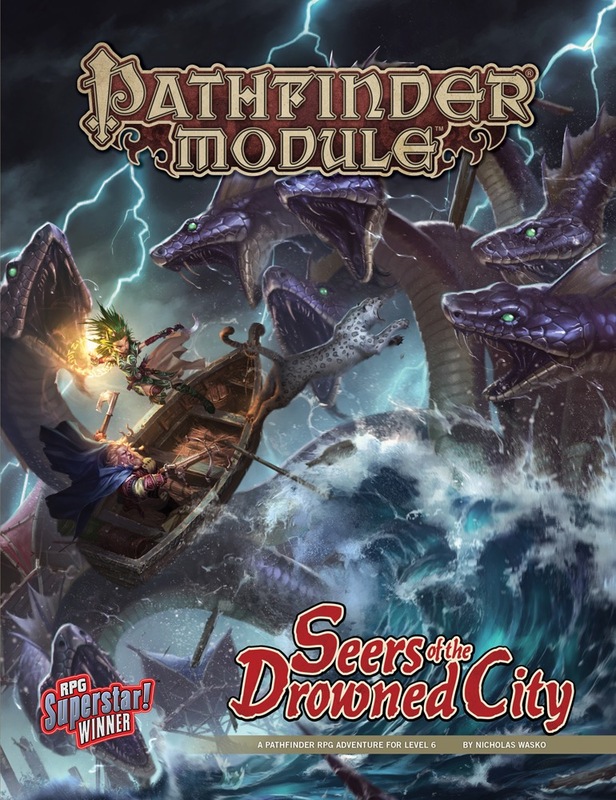 Seers of the Drowned City is sanctioned for use in Pathfinder Society Roleplaying Guild. I love the sandbox nature of this mod. The exploration and investigation aspect if something I really enjoyed. This module is a lot less linear, and I really enjoy that. The villains are good, some of the npcs can be friend or foe based on player's actions, and the artwork is great. Overall, very well put together. If you want an adventure that is less rail road and more sandy, here is your chance. The giant squid zombie illustration. The "flip-mat" side of the poster map. Some magic items are cool. The adventure itself has some good ideas. The fact that this can be connected to the previous module. The city map side of the poster map. The Hyrantam article is too short and underdeveloped. Most creatures from the Bestiary section. A GM has to put some serious extra work into this. Now available for preorder! Product image and description subject to change. At last Lirgen is explored! I hope this has a map of Hyrantam on one side of the battlemap! The Sodden Lands are a great setting and i hope we get a Campaign Setting book one day. Glad to see a new module that's not just for 1st level PC's. Still hoping we'll see a few mid-to-high level modules as well as one or two super dungeons come out by this time next year. A definite +1 for The Sodden Lands Campaign Setting book in the future! Nice thing the underwater/aquatic fraction gets something so shortly after the horror/ctulluh fraction get theirs. Very excited about this one--perhaps as a follow on after starting PCs play through Ire of the Storm. This could make for a nice little mini-campaign with some homebrewed filler to get the PCs up to 5th level. I was under the impression that Ire of the Storm ends at 6th level. Any ideas on how to link them together? The Sodden Lands is the one place I have really wanted to go to...ever since I first read about it in the Pathfinder Chronicle Campaign Setting. I am very excited for this one, and may have to also try and link it up with Ire of the Storm. They seem to be thematically linked. Seeing that there are some significant similaraties in theme between Ire and this adventure, while I was developing "Seers of the Drowned City" over the past few weeks I adjusted it upward a level. The final adventure will be for 6th level characters, and will contain some advice for running it as a sequel to "Ire of the Storm." Awesome! James, you are a gentleman and a scholar! That's fantastic! I love Ire of the Storm and was hoping this might work as a sequel to it. What level should PCs who complete this adventure be? 9th? Updated with final product image and description! Some great covers lately, indeed! Nice beena while since we had Lini on a module cover. I honestly think the title isn't what will sell this book. That's some nice cover art right there. Awesome artwork. I was just thinking how I hoped a hydra would show up in this adventure and then this! Agreed. I also think we might get something like "From the Sea" Forgotten Realms vibe kind of deal. That is one beautiful, awesome, pulpy cover! This module isn't showing up anywhere in my upcoming subscriptions anymore; a couple of days ago, it was in November. Any update on how far it is slipping? It's not on the product schedule page anymore. That could mean that it is pushed back to december but that is unlikely. It will probably be out in 2017, but if in january, february or march will be seen. There's definitely something screwy going on. I went for "copyright/IP infringement". Now it's showing up in november again on the product catalog and schedule page. Strange. I apologize for the confusion folks. It's kind of amazing what a missing click can do. Should be all patched up now. If anyone purchased it in the last couple hours while that was available, your Digital Asset was suspended and it will be unsuspended after we begin shipping to subscribers (estimated October 31st). How is the poster map of the ruins of Hyrantam? At 1340 pop it is slightly bigger than Sandpoint (1240). How long is the settlement article in the back? So anyone have this yet and if they do hows the art? I second Nick's request, what are the new monsters? I see up-thread that this module can be used as a potential sequel to Ire of the Storm. I am trying to pick out possible adventures for a gaming group I may be joining, so I was wondering how many levels this one covered. I think an AP might be a tad too long for us, but if the two paired together got us to 9th or 10th level, that could be pretty cool. This looks to be the last module for at least 7 months, as there is none scheduled until including june 2017. How about magic items? I'm, uh, asking for a friend. How is the poster map and how (long) is the description for Hyrantam? One side is a water/ship based single encounter area. Other side has a large-scale map of Hyrantam and the surrounding area. Hyrantam writeup is 6 pages inlcuding statblock, rumors, random encounter table in addition to the normal settlement writeup info. What level does this module end at? The module begins at 6th level on the medium XP track. The introduction mentions that the party should be at 8th level by a certain encounter. I have no idea whether or not the final encounters are sufficient to get the party to 9th level.